Ninja-chat became an alternative for omegle and other similar services. This is online chat with a random strangers without registration. When at least two people open the website they are connected in one chat room. People can chat anonymously (or not). This is best way to find new friends around the world, besides this is very fun, because you don’t really know who is will be next random opponent. 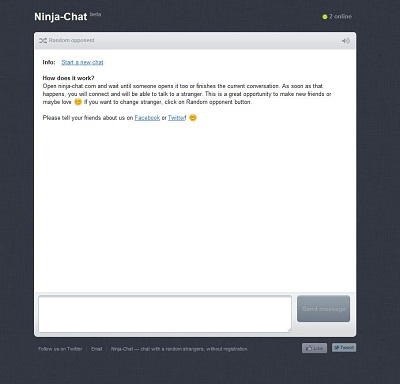 We make Ninja-Chat with improvements of graphic design in contrast to competitors. We improve readability by following the rules of typography. Last opponent message has a higher contrast. Added graphical smileys in iChat style, that adds automatically. Increases input message area for more handy adding a message.